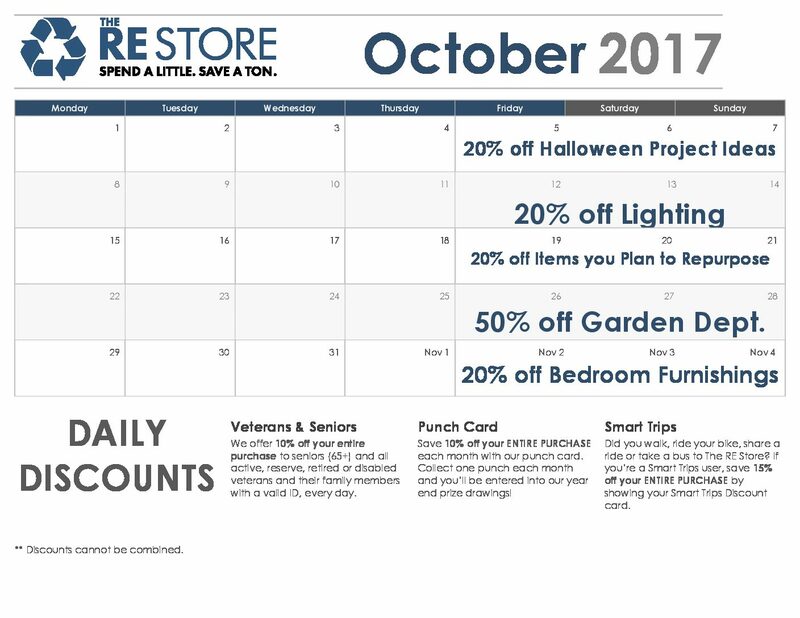 The first weekend of October kicks off with 20% off Halloween Project Ideas! These projects can be anything relating to Halloween celebrations including: costumes, props for a haunted house, and decorations. The next weekend is 20% off all Lighting which includes lamps of all shapes and sizes. Then we have 20% off Items you plan to repurpose including any pieces of furniture you plan to stain or rebuild. Let your creativity run wild – we love seeing what our customers create. If your repurposed project is especially awesome, send pictures our way and you’ll be entered to win a $25 gift card. The weekend of the 26th is our 50% off garden department. That’s right, everything in our garden department must go to make room for winter items! Stock up for spring with pots or new gardening tools and save a ton of cash while you’re at it. When you’re checking out with your Halloween and repurpose project items be sure to let the cashier know so you don’t miss out on the deal.